GPS Receiver: Bluetooth or USB? Just registered. Thinking to buy a GPS receiver to convert my PC to a GPS using offline maps, in no cell phone signal areas. Just wonder which type I should buy, USB or Bluetooth? Accuracy is preferred. Mostly I'll use it in the truck. Disadvantage of BT is batteries must be charged and more expensive. Advantage is easy placement. Charging is usually only necessary after 20 hours or so. Disadvantage of USB device is cabling, use of limited USB ports and more difficulty in placement. They are less expensive and very good if you get one that is not connected directly next to the computer. Both types are available with great sensitivity. Thinking to buy a GPS receiver to convert my PC to a GPS using offline maps, in no cell phone signal areas. You might want to step back and consider whether this still makes sense in 2017. There is almost no PC software for navigation anymore, things have changed a lot in the past five years. You can use your phone with offline maps and no cell signal, there is quite a lot of nice software for this on both iOS and Android. You just need to choose an app that allows you to install the map on the phone. If you tell us what kind of phone you have and what kind of maps you want, we can make some suggestions. But Terry makes some good points, bluetooth devices are more expensive and need to be charged. But I just wouldn't waste money on a device that only works with PC's in 2017. Thank you Terry and Boyd for the information. I am using Google Pixel, and planning to buy a tablet or a small size laptop. I go to remote areas where three is no cell phone signal, mainly for hunting. Very often I need to search the nearby area on satellite maps. I thought it's good to search the map on the bigger screen of the tablet or laptop first and then bring the cell phone with me when traveling. Appreciate if you guys could provide some suggestions on which App is good for this purpose and how to get offline satellite maps. By the way, I already bought a Canmore GT-750FL GPS receiver. It has both in USB AND Bluetooth interfaces. The sites selling it state that it can be connected via either USB or Bluetooth. But neither the manufacturer's product info nor the user manual mention anything about connecting it to a host via the USB port, for anything other than a "G Mouse" (whatever that is). Here is a GPS chipset/receiver comparison chart, for future reference. I found that I have had one of these for years. It works well using both the BT and USB interfaces. I had forgotten that it was a data logger. It always gets taken on long trips as a backup. When I was in Europe for 6 months in 2008 the proprietary USB cable for my Holux GPS died. Fortunately, it could be powered by a standard USB cable and I was able to connect to it using BT. Since then I have always taken several GPSs away, just in case. It isn't as critical as it was, now that we carry 2 phones with satnav apps built-in that can also share the GPS signal via BT to the laptop. I still use the laptop because I need to be able to load POIs for motel chains, campgrounds, national and state parks, tourist sights and sites, etc and see them on the screen when I am planning our route. We are going to USA for 2 months Sep to Oct so I am deep in planning. It wasn't very well planned because we arrive at LAX 2 days before start of Labor Day long weekend which means accommodation is in short supply and is expensive. We are going to head NE through NPs to Denver, across prairies to St Louis and then NW following Lewis and Clark Trail to Oregon and Seattle before heading S down coast and back to LA. I will be using S&T 2013 as my main satnav software. I don't have a current licence (I had two but they have been used on other long departed PCs) so I have to run the 14 day trial in a VBox virtual machine using an unlimited corporate licence of Win XP, a leftover from my pre-retirement career in IT support in a large corporation. If you install S&T in a VM but don't run it before cloning it whenever the trial ends you just open another clone VM and it starts with the full 14 days. After reading about CoPilot for Windows I may try that. I already have it on my Android phone. Are there any Laptop GPS World readers along / near our proposed route that we could call in and say Hi to? We're not looking for free accommodation; it would be fun to just have a chat with a "local" about GPSs, travel, whatever. Andrew, what is the closest point in your travels to Regina, Saskatchewan, Canada? According to Google Maps St Louis to Seattle is about 3500km. Going up to Regina and back into Montana takes this out to about 4300km, so 800km more. The things we want to see (Mt Rushmore, Devil's Tower, Badlands, Yellowstone) are along the the SL-S route so if you drag the route back down it blows out to 5200km. I'm afraid this means we won't be going to Regina, on this trip. Maybe on our next one we will do a Canada only trip. We did Glacier / Waterton Lakes NPs, Calgary to Vancouver on our last trip in 2010 and Windsor / Detroit to Quebec City in 1998 and Niagara to QC in 2008. Also, way back my cousin was exchange teaching near Sudbury so I went there in 1979. I guess should have expanded that a bit. I meant the question literally. If you go on the route you have planned for your own purposes what would be the closest point on it to Regina. My thinking is if the timing works, the weather is decent, and not too terribly far it could be a good excuse for a bike trip. It uses the same MediaTek Very high sensitivity GPS Chipset (Sensitivity: -165 dBm) as the Columbus V-800. 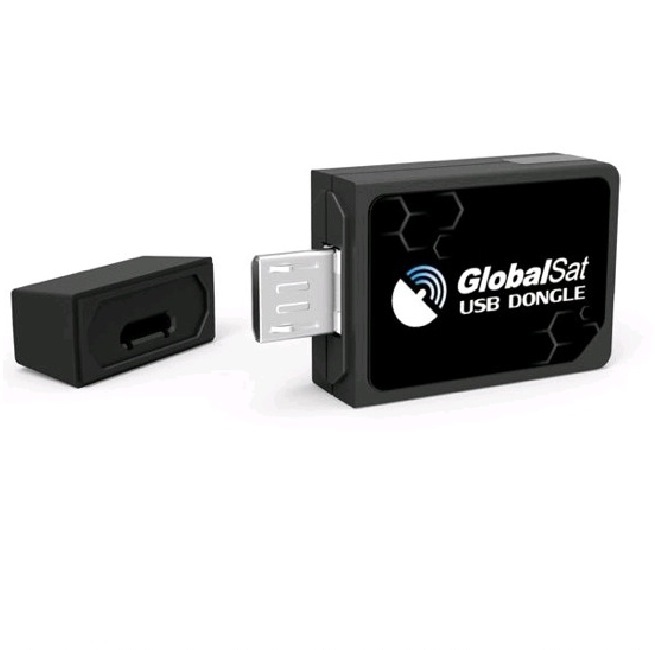 This is the first one micro-USB GPS receiver I've seen, and an option for USB-port-challenged Windows tablets or Ultrabooks that have no internal GPS. ...This is the first one micro-USB GPS receiver I've seen, and an option for USB-port-challenged Windows tablets or Ultrabooks that have no internal GPS. It looks like the connector is a micro-USB male. I'm not sure how you would connect it to a PC which normally has female USB-A ports. ??? That is the correct connector for some small tablets that only have one jack...a micro USB. I would have problems considering it because that same connector is also needed to power the device. Also that might cause a problem with the USB receiver being in close proximity to the device itself. BT is a better solution. Or an OTG adapter. I mainly posted that just because I'd never seen a micro-USB GPS receiver, and the overall size is very small. I'm not even sure if it's USB-To-Go compatible. If not, it still won't work with most Android tablets because their micro-USB ports aren't host ports. As may be obvious, I'm not a huge fan of bluetooth receivers because they still have to have power all the time when used in the type of installation I contemplate. That may only be slightly easier than plugging them in directly, which avoids any issue with losing/re-establishing the BT pairing. Ken - I was at Best Buy over the weekend, and saw several Windows Ultrabooks that had no full-size USB-A ports, including the new Dell XPS 13 inch 2-in-1, and some others too. I did not look at them closely, but come to think of it, I think most of them had the newer USB type C ports rather than micro-USB. I'm pretty sure some Dell Latitude tablets/2-in-1s have no full-size USB-A ports (these were not the newest units, so whatever port they do have is micro-USB, but a separate charging port, usually right at the docking connector, so the tablet section can receive power from the dock or directly from a power adapter). Terry - True, having only one micro-USB port for power and data is a drawback of that on Android tablets. But don't the higher-powered Windows tablets use a separate charging port? If somebody intends to buy a mid-size Android tablet for use as a nav unit, IMO the best way to go is one of the 8 inch LG tablets (GPad, or GPad X) because they are unique in having a full-size USB-A host port in addition to the micro-USB used for charging. But their built-in GPS is excellent, so most people probably have no need to add an external GPS receiver to them. The main application for that micro-USB GPS receiver is one of the newer, smaller Windows Ultrabooks or tablets that don't have internal GPS or a full-size USB-A port (or maybe they have only one, but it's occupied by something like a Logitech Unifying Receiver). Of course if all the newer ones are all USB-C only, and no micro-USB, then, well, "never mind"
An OTG adapter is merely a cord with a male micro USB connector on one end and a female USB A connector on the other end. You would use this cord to connect the standard USB GPS to the tablet. • GPS receiver: should I use USB or Bluetooth?